Car accidents can be hazardous for pregnant women and could very well be the leading cause of trauma-related maternal and fetal mortality. In such instances, buckling up is the best way for an expectant mother to prevent injury and death from a motor vehicle accident. Research shows that unborn babies have the best chance of surviving car accidents when the mother uses her seat belt properly. There is no evidence that suggests that seat belts can harm unborn babies. Seat belts greatly reduce the mother’s risk of injury in a car accident. If the mother stays unharmed, there is a good chance her unborn baby will, too. But if the mother is hurt in an accident, her unborn baby could also suffer. Maternal injury during a car crash is linked with premature birth, low birth weight, placental abruption, distress to the unborn baby and even death of the fetus. Proper buckling is the key to keeping you and your unborn baby safe. Run the shoulder strap between your breasts. Ensure that the belt fits snugly and there are no loose ends anywhere. If seat belts are not worn correctly, women can be at an increased risk of abdominal injuries and uterine rupture. Check your seat belt to make sure it's not too loose or too tight. While sitting at the back, always wear both lap and shoulder straps of the seat belt. Never try to wriggle out of the shoulder strap and place it behind you while reaching for something in the car. Do not run the lap strap across the abdomen. If your car comes with airbags, keep it in activated mode at all times. Air bags provide sensible padding and protection to the head, rib cage, and stomach during accidents. Always adjust your seat position before going on a drive. A safe seat position would be approximately 10 inches from the dashboard. As far as possible, refrain from taking long road trips. Try not to spend more than 5 to 6 hours a day in the car. In unavoidable situations, try stopping every two hours to refresh and walk around for a bit. Also, stretch your legs and wiggle your toes as often as you can. It helps lower the risk of blood clots and reduces swelling in your ankles and feet. Always keep information about your doctor and details of your emergency contact in your bag. If involved in an accident with a pregnant woman, call the doctor right away, even if it is minor. Seat belts offer the first and best level of protection in moving vehicles. They are important and should be used by all, especially pregnant women. Most pregnant women avoid using seat belts because they don’t like the way they feel or fit. 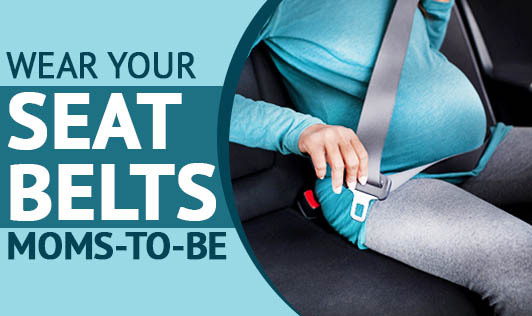 But it is important to remember that seat belts and their positions are specifically designed to protect bony areas such as the pelvis and lower rib cage, that is often more prone to hurting during a motor vehicle accident. Therefore, always remember to buckle up beforehand. If you do it the right way, it will ensure a safe and joyful ride for you and your baby.